The Alaska International Airport System has the most liberalized air cargo transfer rights in the United States. 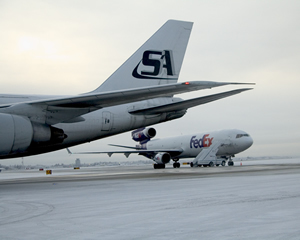 Air carriers can create new opportunities for global cargo logistics and integrated alliance partner networks by taking advantage of expanded cargo transfer rights at Ted Stevens Anchorage International Airport (ANC). As of January 2004, a new law permits air cargo to or from a foreign country to be transferred to another airline in Alaska without being considered to have broken its international journey. Take advantage of alliance partnerships through true interlining capabilities. Lower operating costs by eliminating lower revenue producing legs. Opportunities for true transfer and transload operations. Test market conditions without committing aircraft by utilizing code-share agreements.